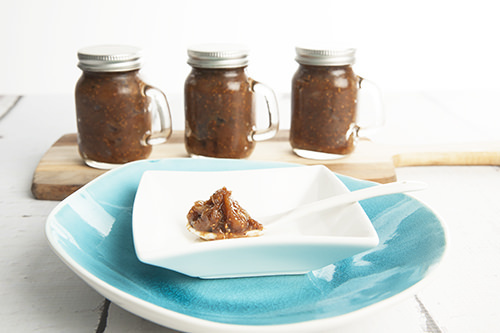 I love condiments and this Savoury Fig Jam is the perfect addition to your cheese plate. I have turned into a real savoury person over time. Anything that matches well with cheese, or makes my sandwiches taste better is a winner. Fig is delicious served either sweet or savoury accompaniments. 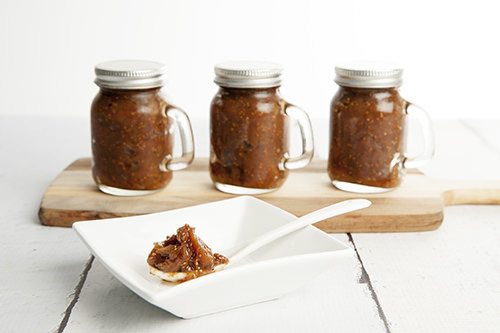 Today I’m sharing a recipe for a Savoury Fig Jam. This recipe comes from Romane’s mother in France. 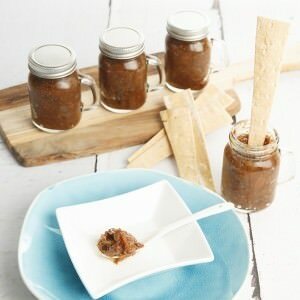 She makes this jam to serve with a pastry hors d’oeuvre. A triple smoked ham is wrapped in puff pastry and dipped into individual pots of the fig chutney! YUM! On a side note, Romane’s English is fabulous but we did have a minor language faux pas whilst making this dish. When Romane was telling me about the Fig jam she was calling the dish a “Chooteney.” It sounded like such a lovely name for a dish. Very French, very chic! I was intrigued and asked a lot of questions about the dish that was to be served with the pastry hors d’oeuvre. I finally realised she was saying “Fig Chutney”. We had a bit of a laugh. I think her French pronunciation is much nicer than the English chutney. She told me everyone in France says it like that! The Fig Jam could also be served on a cheese platter. 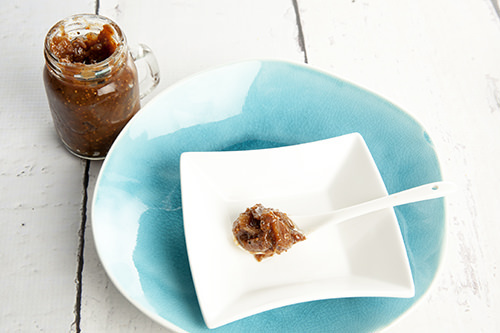 Given that we are coming into Christmas I thought it would be handy to share this recipe so you could make your own homemade fig paste. Make a tea with the water and place the brew in a bowl. Chop the figs into 1cm squares, removing the stem first. Place the chopped figs into the tea and allow them to steep for 20 minutes. Fry the onion in oil until cooked. Drain the figs and reserve the liquid. Add half the tea liquid to the onion and cook for a further minute. Combine the figs and the onion mixture. Stir well then add the sugar. Cook for five minutes stirring constantly. Add the vinegar and all the spices to the pot. 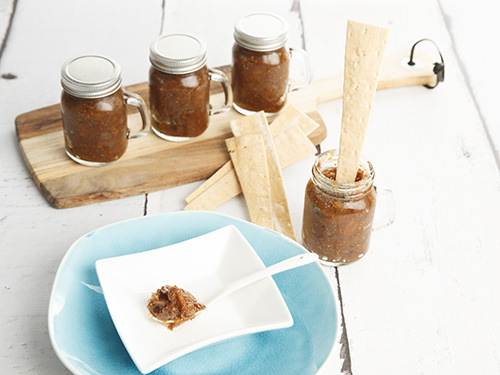 Continue to cook the fig jam for 30 minutes over a low heat, stirring constantly. Add any additional tea liquid if required. Place the jam into sterilised jars and then refrigerate. I’ve made a double batch of jam because I am going to bottle some and give it as gifts in a homemade hamper. I also need to have leftovers to I can try the smoked ham wrapped in pastry. I have been drooling over the thought of this dish since Romane described it to me. Tell me readers, do you have dishes that you make each year to give as gifts. 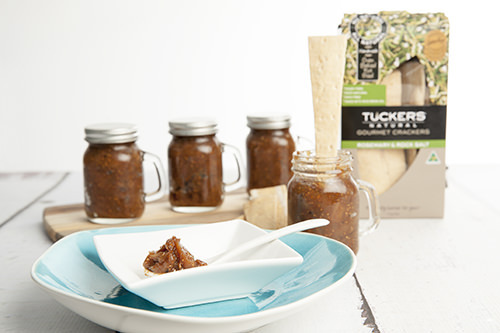 This year I’ve made a hamper which includes this savoury fig chutney plus these other treats from my site. I make the rum balls every year. To gift wrap them, use clear cellophane bags which are big enough to hold three. 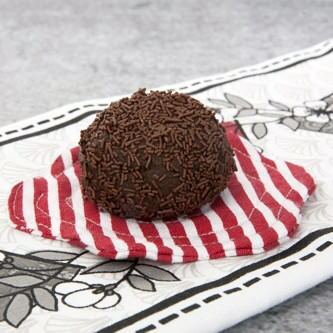 I usually wrap cardboard in aluminium foil and use this as a base to put my rum balls on first. Then it’s easy to put them into the cellophane bag and add a ribbon. 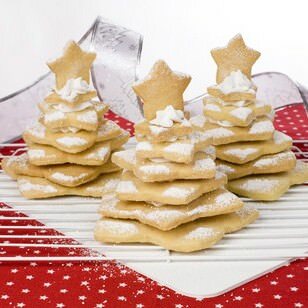 I’ve just finished baking the shortbread cookies which will allow me to make two of these Shortbread Christmas Trees this year. For something a little different I added smarties to the tips of the trees to decorate them. 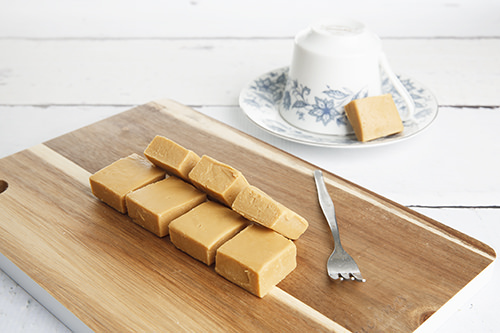 The inclusion of my Salted Carmel Fudge in the Christmas cooking was at the request of my hubby. His dad loves this caramel, so I made a tray and wrapped it ready to bring along at Christmas time. Snapchat for Bloggers – How Important is it?